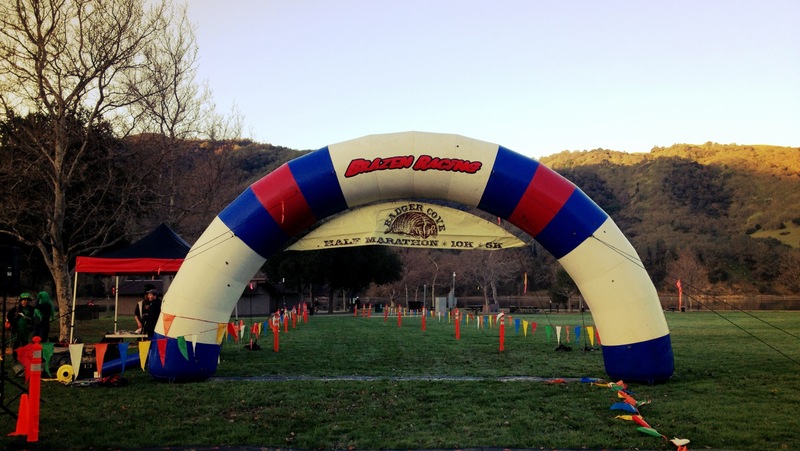 This past Saturday, I ran Brazen Racing’s Badger Cove Half Marathon, held at Del Valle Regional Park in Livermore, CA. As is typical for Brazen events, they had three distances: a 5K, a 10K, and the half marathon and drew a field of 340, 369, and 240 finishers respectively. With Sunday being St. Patrick’s Day, there was a lot of “green” on the course! The weather was perfect: clear and cool (~46* at the start and probably the mid to upper 50s when I finished) – exactly what one would hope for on race day! 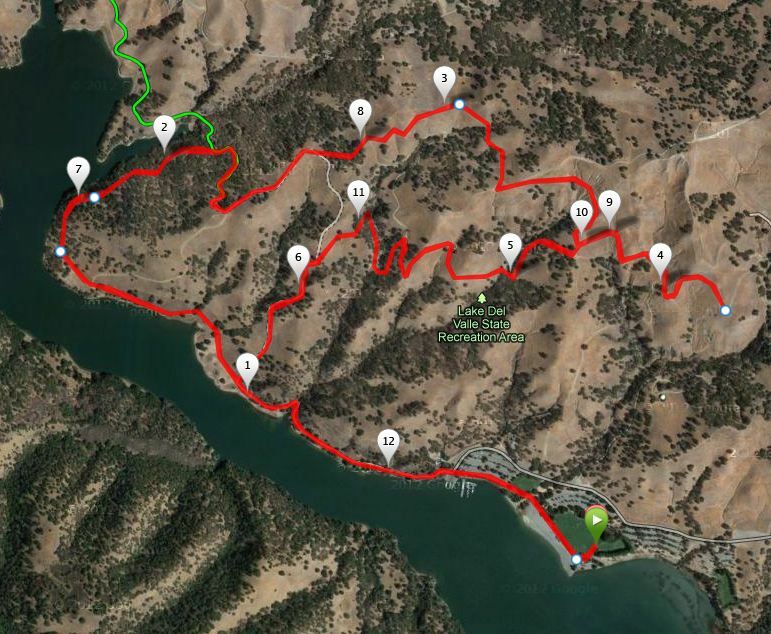 The half marathon course was a lollipop with an added out and back and was great mix of fire trails and single track…with a short, paved portion at the start/finish. Half marathon runners did the loop and O&B twice, so the first pass was a good indication of what lied ahead as the run/endurance levels progressed. Course marking was great and the on-course volunteers were awesome – as usual for Brazen events! The post-race festivities were great – always a good mix of food, fun, and even a few vendors, including a Skechers tent. I’m a huge fan of Brazen Racing and recommend them to friends all the time. Their events (which are mostly held on Saturdays) are great for all levels of runners and are reasonably priced. If my schedule allowed, I’d run all their races… One of the many things that sets Brazen events apart from most other events are their race photos. They use volunteers to take pictures and then post them for people to download for free – how cool is that! You do have to scroll through them to find yourself; but, in a time when bigger events who charge more money for runs also charge upwards of $30 for a single photo, this is awesome! As of this morning, there are over 5,000 pictures from the Badger Cove event posted for people to sift through and download. My favorite trail race photo is from a Brazen event volunteer! Right now, everything on the running front is geared toward April 28: Big Sur. 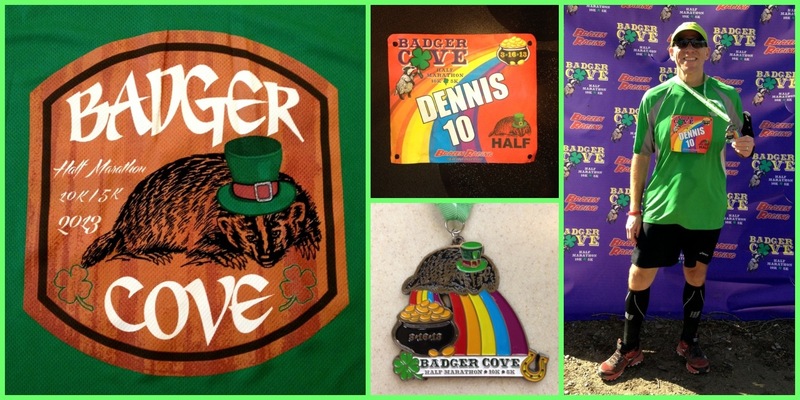 So, my goal for Badger Cove was a “LSD” – long slow distance run. I DO NOT want to do anything that results in an injury ahead of Big Sur, so I planned to take it easy…within reason, of course…and not do anything silly. Given that it was a trail half, I knew taking it slower on the course would be easier given the hills. I did take it faster than usual on the downhills this time, feeling confident – though taking a chance at slipping at times (weeee). The downhills felt good and actually benefited my overall time: slower on the uphill, make time up on the downhill – kinda the way it’s supposed to be anyway, I guess. I also worked at conserving energy, taking speed walk breaks earlier. This seemed to benefit my later miles and allowed me to finish strong. This was my third full trail half marathon and my best trail* half time (or PR) by 2.10, so the strategy worked. I’ve decided to track road and trail PRs separately since there are marked differences between these races. I’ll still have an overall PR, but will also track them be category as well – not sure if this is correct, but that’s what I’m doing. I ran with the same group of 4 or 5 runners most of the race; but, at about mile 9, I felt good and picked up the pacing. I know I could have finished under 2 hours if I had pushed it, but that wasn’t the plan…next time. I did try a new piece of gear this race: calf compression sleeves. I have two brands that I have been testing during my training and wore the CEPs on this run (the other ones I have are Zensahs.) I really liked the way they felt and supported during the race and I didn’t really seem to have any issues with tired legs after either. I think the sleeves are keepers…still deciding on which brand I like best. I followed my normal pre-race carb loading plan (36 hours of >80% carbs and +500 calories above my normal day) and my usual race fueling plan (bagel at -3 hours, GU at -45 min, GU & salt tab at -15 minutes, and 21oz of GU Brew, an additional salt tab, and 3 GU Gels along the way.) Since it was sunny and warming up in the later part of the race, I hydrated a little more than usual for a 13.1, refiling my handheld at (I think) the mile 8 aid station…which was a good thing. After cooling down in the post-race area, I felt pretty good. I hung out and waited for the results to be posted and then headed home. Bottom line: Great event! New trail half PR! More lessons learned about trail running and my capabilities/endurance level. Post-race meal: I went for it… Double Quarter Pounder with fries – BOOYAH!!! Comments: I did 5.67 @ 8:20…aaaaand oddly enough found myself humming the “There Was a Farmer Who Had a Dog” twice during my run. Yeah, I’m weird… B-I-N-G-O!